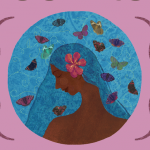 Traditionally, women all over the world have used cloth to handle their monthly menstrual flow. These days, however, disposable menstrual products such as pads and tampons are more commonly used around the world. Promoted for their convenience, these products are interpreted as a step towards women’s liberation and modernity. However, disposable menstrual products come with immense health and environmental issues. Residual pesticides – Most major brands of tampons and pads contain non-organic cotton or wood pulp grown using agrochemicals and pesticides. Dioxins and plastic chemicals – The hazardous nature of chemicals are cause for concern that calls for further research(1). The WHO classifies dioxins as a highly toxic environmental pollutant and health risk(2). Dioxins are produced in chlorine bleaching processes. 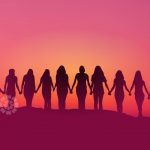 A possible link to cancers, endometriosis, immune system depression and pelvic inflammatory disease has been established(3). BPA and BPS disrupt embryonic development and are linked to heart disease and cancer, Phthalates are known to disregulate gene expression and DEHP may lead to multiple organ damage(4). 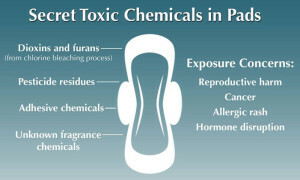 The call for further research to reduce on health risks to women from dioxin and other chemicals has been raised in the US Tampon Safety Act and Robin Danielson Act since 1999(5). The US Endometriosis Association indicated to use organic cotton sanitary products without plastics until research addresses the risks(6). Bacteria and fungus toxins – Synthetics and plastic also restrict the free flow of air, can trap heat and dampness, potentially promoting the growth of yeast and bacteria in your vaginal area, a possible cause for vaginitis(7). Sanitary waste is HUGE – The products we use add up. If only a quarter of India’s menstruating adolescent girls alone used disposable pads, 90 million would be disposed or burned every month alone. There is n o ‘away’ – The plastics and components as well as the wrappers of disposable products are largely non-biodegradable, presenting huge waste management challenges around the world. Research has shown that each conventional sanitary pad contains the equivalent of about four plastic bags! A single pad is estimated to take 500-800 years to decompose in landfill. When pads are flushed down the toilet, sanitation workers have to descend into manholes to remove and handle used menstrual products from sewer blockages, public toilets, household trash, or even the roadside. These tasks are often done without protective clothing, gloves or masks. which puts the workers at risk of contracting infections with potentially deadly viruses or diseases. You can read more on these issues here. 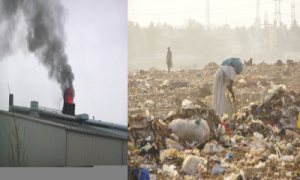 Burning releases environmental toxins – In many parts of the world, disposable menstrual products are burned by individuals or in incinerators along with other waste; this causes dioxins and other chemicals to be released which creates toxic ash and fumes. Read more about incineration here. Cloth washable pads and menstrual cups are safe, hygienic and environmentally friendly alternatives to disposable menstrual products. Eco Femme cloth pads are made of cotton flannel with a thin layer of leakproofing PUL on the bottom layer to ensure a safe feeling. Cloth pads do not contact the skin with any plastics and therefore eliminate the risk of exposure to its potentially hazardous substances like dioxins, BPA, etc. 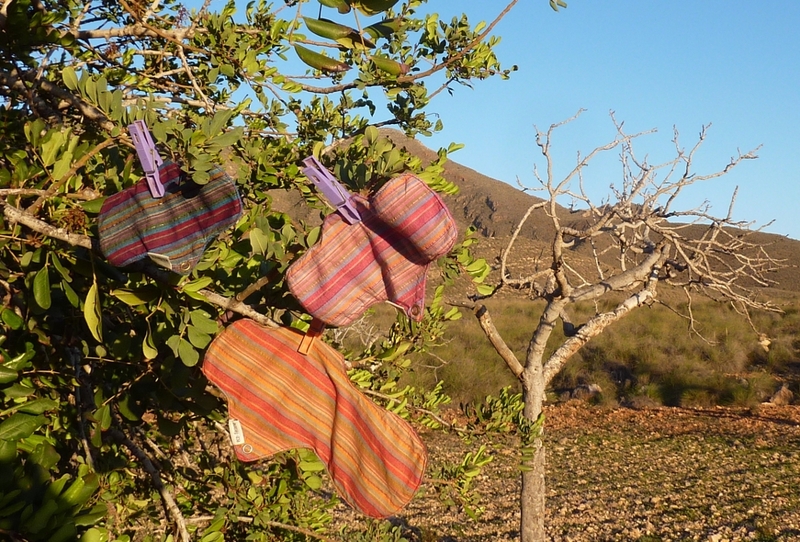 When cloth pads are washed well, dried in direct sunlight and stored properly, they are perfectly hygienic. Cloth pads are also a great option to reduce the monthly cost a woman spends on menstrual products. 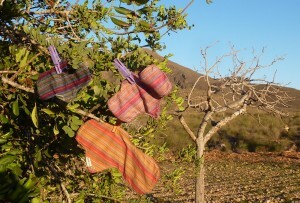 Our pads are washable and reusable for 3+ years. This means, that while a woman will be spending on average 2520 rupees on disposables for this time period, the cost for the cloth pads will come down to 945 rupees.